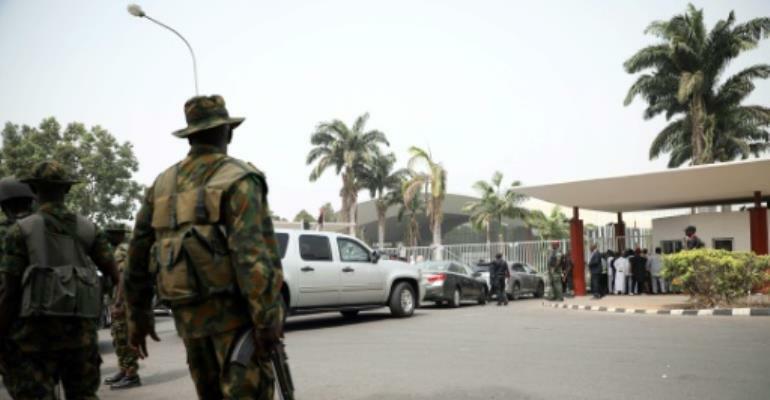 Boko Haram's Islamic State-backed faction has claimed to have executed five Nigerian soldiers but security sources told AFP on Tuesday three of those killed were civilian militia members. The Islamic State West Africa Province (ISWAP) video, dated April 1 and said to have been filmed in Borno state, northeast Nigeria, was published online by the IS propaganda arm Amaq. It showed two men in military fatigues and three in red-orange jumpsuits reminiscent of those worn by IS hostages in Syria and Iraq. All five are shot in the head at point-blank range. Nigerian Army spokesman Sagir Musa said only that he had seen the video. But three senior security sources said at least three of the five were not soldiers. "We have identified three of them as CJTF (Civilian Joint Taskforce) who were held by ISWAP in Baga in December," said one of the sources on condition of anonymity. The CJTF assists the military with security. ISWAP attacked military bases in and around Baga, on the shores of Lake Chad, in northern Borno, in December last year. The sources said the militia members were trying to flee with civilians when they were detained. All three had been presumed dead. "The first three from the right are known to us by name... We are still working to establish the identity of the other two," said one source. "What is surprising is that one of them in military uniform was arrested in his civilian clothing and now he was given some military uniform to make him look like a soldier." The video comes as Nigerian and regional forces have intensified their activities against ISWAP in northern Borno, particularly around the towns of Monguno and Marte. The Nigerian Army and the Multinational Joint Taskforce (MNJFT) comprising troops from Nigeria, Benin, Cameroon, Chad and Niger both claim to have inflicted heavy losses. The video will fuel speculation about the direction of ISWAP, which has claimed or been blamed for a spate of attacks against military bases since July last year. There is also wider concern about an increase in jihadist activity in the wider Sahel region, particularly in Burkina Faso, after IS's Middle East "caliphate" was declared defeated. ISWAP under Abu Mus'ab Al-Barnawi broke away from the group led by Abubakar Shekau in mid-2016 in opposition to his indiscriminate targeting of civilians. Well-informed sources told AFP last month Al-Barnawi had been ousted, some six months after his deputy, Mamman Nur, was killed by more hardline fighters. They had been angry at Nur's more moderate approach and back-channel talks with the government, which is seeking an end to the conflict after nearly 10 years and 27,000 deaths. He was also accused of pocketing a putative ransom payment for the release of more than 100 schoolgirls abducted from a school in Yobe state in February last year. ISWAP previously published a video online showing the execution of an aid worker kidnapped in a raid in the Borno town of Rann last year.